Sometimes you come across people, and you know you love them, but maybe you don't realize how inspiring they really are until they're gone. He found something he loved, and stuck with it forever. Through the [very little] good and the [lots of] bad, no matter what. He was proud, SO proud, of what he loved. That's such a great characteristic to have. Most importantly: He was friendly. For DECADES he'd go to the games and take a picture with every fan he could. He'd talk to them. He'd experience things with them. He didn't have to do any of that, but he did, without hesitation. Maybe he wanted everyone to love the games the way he did, or maybe he was as interested in everyone as they were him... either way, it was always a pleasant meeting that I experienced. One of the last games, not only did he take another picture with me, but we had a little dance party for a solid 30 seconds. He was jumping and spinning with me before whispering in my ear "you're gonna kill me girl!" I'm not gonna lie, I got hella nervous and then realized I was dancing with a 70-something year old man and cherished all of it even more. Still, it wasn't until tonight that I started looking more into everything he's done. I'm checking everyone's tweets, what he's accomplished, etc. He's leaving the most positive legacy. 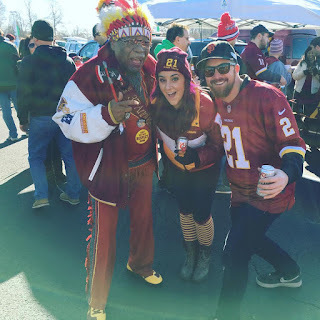 Getting ready for the game remembering this epic moment @luvelizabethany had with the #ChiefZee last weekend. #HTTR!!! 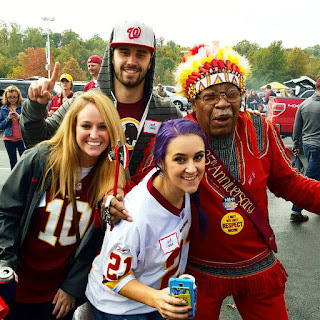 He may be "just a superfan," but did you know there's a Chief Zee Day in DC on November 7? That happened in 1985. How about the fact he lived on Social Security, and relied on fans to help him pay rent, while receiving his motorized scooter from Dan Snyder? He may not have been an "official mascot," but he had the support of every Redskins fan and player. I also learned tonight that he was beat up by Eagles fans back in the day, leaving him with a broken leg. Someone later stole his tomahawk, but got it back with the help of Chris Cooley. None of that stopped him from going to the games and being such a kind and friendly soul to everyone he encountered. Sometimes people piss me the hell off and sometimes I just want my own space, but ultimately, meeting new people is my favorite thing to do... and Chief Zee is motivation for brushing off the annoyances and staying kind and genuine all the time [but like, I'll still tease people and give honest opinions, of course]. So thank you Chief Zee for the memories and the thoughts I'm having tonight. I guarantee you no Redskins family will ever forget you, and we'll tell our kids about you, like my family always did to me before I met you. He was such a cool dude. I went to a game with a few people years ago, one of which was a Carolina Panthers fan and the Chief gave him a hard time and they traded a few jokes about the teams. It was funny to witness. Well written post, EB.